Like many early frontier towns, St. Joseph was established as a fur trading post; in fact it was originally founded in 1826 as the Blacksnake Hills Trading Post. The name was changed in 1843, after which this growing Missouri town transitioned into a major supply point for westward travelers. As the birthplace of the Pony Express and the one-time home of Jessie James, St. Joseph definitely has a colorful history. 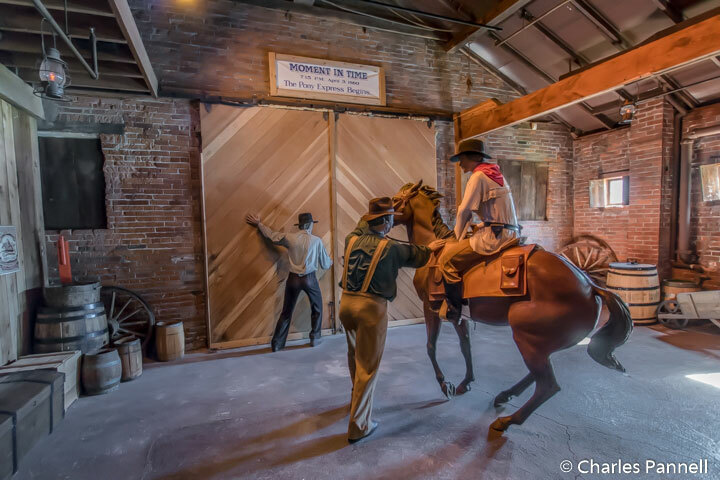 And although the horses are gone from the Pony Express stables, and the James gang is just a distant memory, visitors can still get a taste of those wild and woolly times in the St. Joseph historic district. Granted, wheelchair access wasn’t a prime concern in those frontier days; however today these historic St. Joseph attractions are indeed doable for wheelers and slow walkers. The best place to begin your historic St. Joseph tour is at the Pony Express National Museum (www.ponyexpress.org). Located in the former Pony Express stables, there’s no official parking lot for the museum; however standard street parking is available along Penn Street. There’s also a small parking lot on the corner of 10th and Penn Streets; however it lacks any accessible spaces. The area around the museum features a wide level sidewalk, but there is a short brick pathway in front of this historic structure. St. Joseph was selected as the eastern base of the 2,000-mile Pony Express route to Sacramento, because it was the eastern terminus of the telegraph and the railroad, and because suitable livery and office space were also available there. The museum traces the history of the Pony Express, and offers some insight on the challenges faced by the brave riders. Access is good throughout the single-story museum, and the cement floor makes for easy rolling. A wheelchair is available for loan at the front desk, and there’s also an accessible restroom in the lobby. There’s level access to a small theater which presents a short movie on the rise and fall of the pony express, and there’s space for a wheelchair in the back. 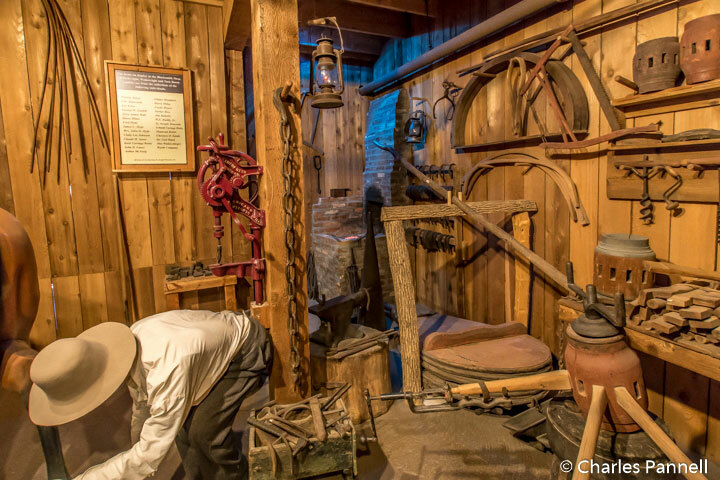 Highlights of the museum include the stables and tack room, where there’s a large collection of saddles, harnesses and blacksmith tools; and a 60-foot diorama that illustrates the geographic features and extreme weather the riders faced along the route. There’s also a replica of a relay station, where riders reportedly had two minutes to get a drink of water, go to the bathroom and change horses. 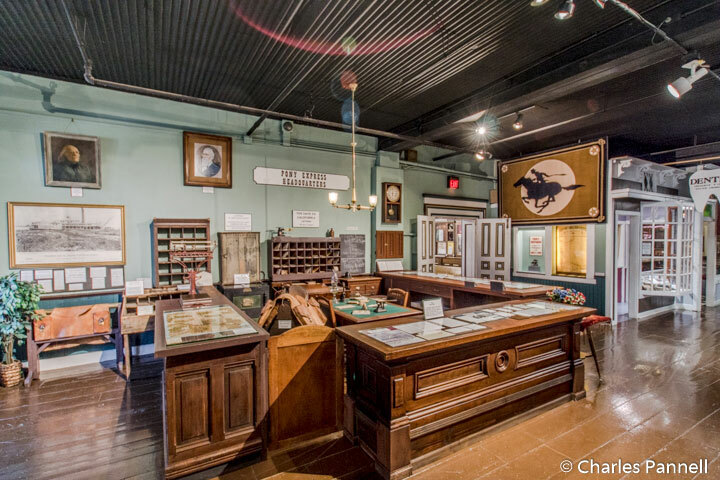 Top it off with the bios of the early riders, and an exhibit about the completion of the transcontinental telegraph, and you have a comprehensive history of this fledgling mail service that only lasted 18 months. The Patee House Museum (www.ponyexpressjessejames.com) is also worth a visit while you’re in the historic district. Although it’s just a short walk down Penn Street from the Pony Express National Museum, it’s best to drive because of the uneven sidewalk and steep street. Accessible parking is available around the corner on 13th Street, and there’s barrier-free access to the ramp that leads to the front door of this historic building. Formerly a luxury hotel, Patee House was opened by John Patee in 1858. Over the years this National Historic Landmark was home to the Pony Express Headquarters, two girls colleges, a shirt factory, an epileptic sanitarium and two other hotels. 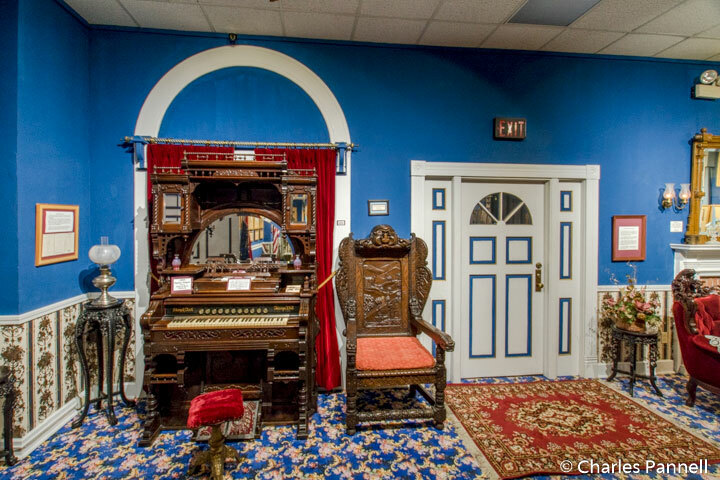 Today it contains a variety of exhibits that pay homage to its colorful history. And even though only the first floor is accessible, it’s well worth a visit. There’s barrier-free access to the Pony Express exhibit, and although there’s a ramp up to the railroad exhibit it’s a bit steep, so some manual wheelchair-users may need assistance. By far the most interesting exhibit is the 1860s street scene, complete with storefronts, homes and even wagons in the street. There’s level access to most of the buildings, and it’s fun to walk or roll through the general store, gun shop, music shop, post office and print shop. Be sure and stop in at Dr. Walter Cronkite’s dental office – and yes the town dentist was the father of the famous newscaster. Don’t miss the Blue Room near the front lobby, on your way out. 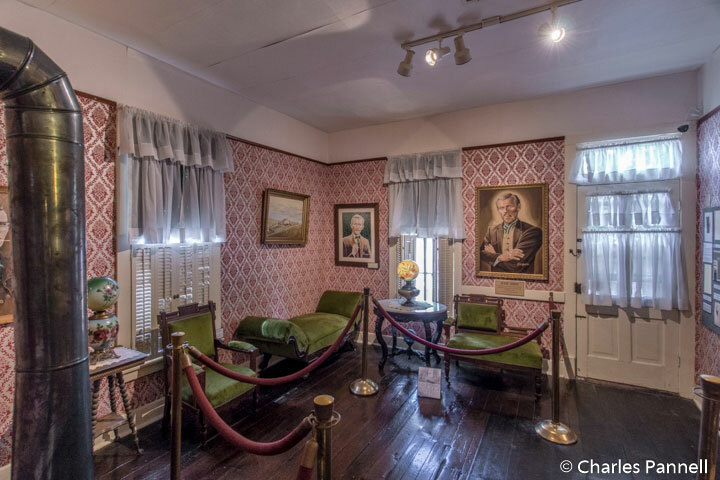 There’s plenty of room to maneuver a wheelchair in this restored parlor, which features over 40 of George Warfel’s life-sized portraits of famous westerners, including Jesse and Frank James. 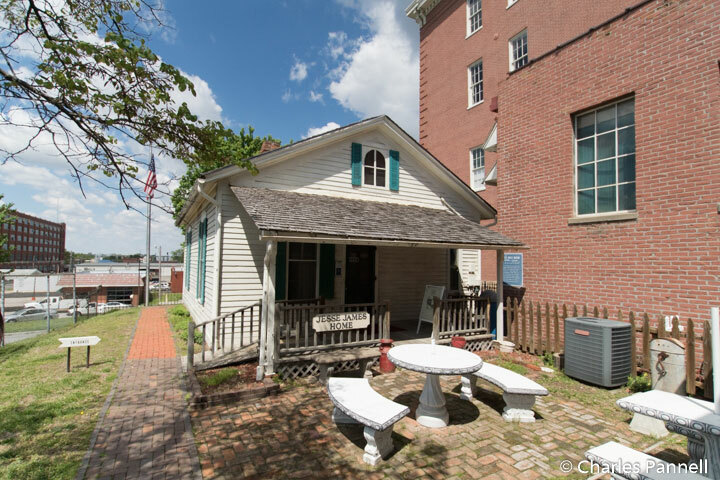 The Jesse James Home is located behind the Patee House Museum on 12th Street; however there are stairs in the front, so it’s best to access it from 13th Street. There’s accessible parking on 13th Street, and from there an accessible path winds around the back of the Patee House to the Jesse James Home entrance. There’s good wheelchair access to this small home, but it can get a little tight if there are a lot of visitors. Best bet is to go early in the day to avoid the crowds. The rooms are decorated as they were when Jesse James was killed at the home on April 3, 1882. As the story goes, he was straightening a picture when former James gang member Bob Ford shot him in the back. You can still see the bullet hole in the living room wall. Admission to the home includes a very informative guided tour, and there’s also an interesting exhibit in the front parlor about the exhumation of James’ body in 1995. His DNA was compared to that of his grandchildren and it proved with 99.7% certainty that James did not fake his death, as some experts claimed. And for a little macabre twist, the remains of the outlaw’s coffin and a casting of his scull are also included in the exhibit.